Glamour reigns in the design of the Allura Collection. Framing each piece is a decorative beveled mirror accent that enhances the illumination from the touch-engaged LED back-light of the headboard and mirror, as well as the under-light of the night stand. Alligator embossing and high polished crystal-enhanced hardware boldly accent the gray, silver or black finish of the collection. Providing additional glamour and functionality to your bedroom are the vanity, stool and decorative bench. The vanity features behind the mirror jewelry hooks, drawer storage, tri-fold mirror and a glass shelf that connects the drawer units. Both the bench and the vanity stool feature crystal button tufting for an added hint of sparkle. 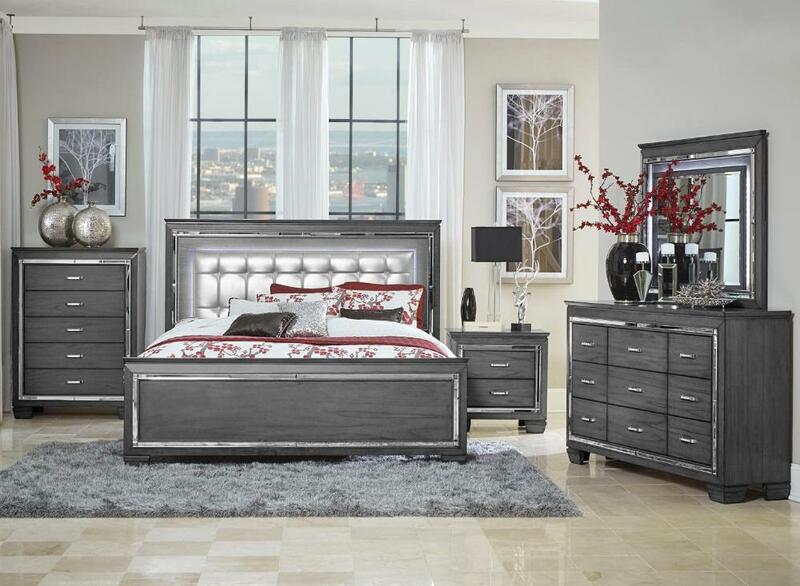 FEATURES: Gray / Silver / Black Finish ~ Faux Alligator Embossed Fronts ~ Bi-Cast Vinyl Headboard ~ LED Light Framing of Headboard and Mirror ~ Beveled Mirror Front Accents ~ Contemporary Style ~ Dovetailed Drawers ~ Ball Bearing Side Glide.